Frosty blue Dichondra argentea 'Silver Falls' cascades over the lip of an aqua pot, while blue oat grass fans out between a pair of angelonias and conceals a mealycup sage directly behind it. Soaring summer temperatures can take a toll on many garden plants. But you can freshen your landscape’s look practically instantly: Just combine crisp white blossoms with a shower of icy blue or silver foliage in a glazed aqua-colored container (pale blue or celadon green are other cooling shades). Set the container in a high-visibility area, such as on a patio or beside an entry. Then notice how the soothing palette mimics the sparkle and cool, watery blue of a swimming pool or water feature. 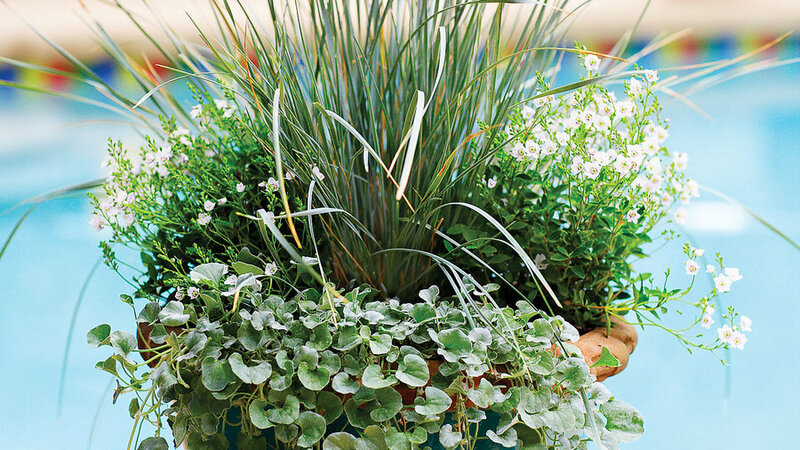 To create the planting pictured above, we first selected an aqua pot at the nursery. Then we chose four plants that combined well: a tall blue oat grass as an accent in the center, lower growers ― mealycup sage ( Salvia farinacea) and angelonia―to surround it, and a spiller (Dichondra-argentea ‘Silver Falls’) to soften the pot’s edges. Place a small piece of fine wire screening in the bottom of the pot to cover the drain hole and help keep soil from washing away. Partially fill the container with loose, well-draining potting soil so that the top of the 1-gallon plant sits below the rim of the pot. Lightly firm the soil to minimize settling. Set the tallest plant, the blue oat grass, at the back of the container. Set the remaining plants into the container, adding soil beneath their rootballs as necessary to raise them to the same soil level as the larger 1-gallon plant. Add the salvia toward the back of the container beside the grass, the mid-height angelonia in front, and the dichondra near the edge so it trails over the pot’s lip. Этот интересный web-сайт с информацией про www.rs-clinic.com.ua.